Owners of multifamily and other commercial properties could see their trash pickup rates more than double when the city of L.A.’s new franchise system for waste haulers goes into effect this summer. Landlords of more than 100,000 rent-controlled buildings – roughly 60 percent of all apartment buildings – will be hit hardest because they are barred from passing on most of the cost increases to tenants. Vargas learned of the likely scope of the cost increases this month as a draft contract between the city and Athens Services Inc. – the largest franchise holder – circulated among waste-hauling industry players. That draft, which was obtained by the Business Journal, contains zonewide collection rates that are between 30 percent and 130 percent higher than what apartment property owners are currently paying. Proponents of the exclusive franchise system said recently enacted state mandates will drive up trash collection costs for all apartment landlords with more than five units, regardless of whether there is an exclusive franchise system for haulers. These mandates include having on-site recycling and composting bins. Los Angeles has an open-competition system for trash collection from multifamily and commercial properties, while single-family residential properties have their trashed picked up by the Los Angeles Bureau of Sanitation. Commercial and multifamily property owners can shop among numerous waste-hauling companies for the best rates, though larger property owners are able to use their market power to negotiate lower rates. But that will change July 1, when the city’s exclusive franchise system for waste haulers goes into effect. This approach, approved after fierce debate three years ago, breaks the city into 11 franchise zones, each served by a single hauler. The city chose seven haulers in the fall to serve the zones; Athens – a City of Industry-based company – ended up with three, making it the largest franchise holder. The new franchise rates will be rolled out during the second half of the year, as the franchise haulers evaluate the levels of services and add-on costs for each commercial and multifamily property owner. According to the draft Athens contract, the base monthly rate for a standard 3-cubic-yard bin collected once a week will be $216.72. That’s significantly higher than the current range of $100 to $187 a month, depending on the location of the property. If the bin has to be rolled out on a special cart – up a slope, for example – the monthly fee jumps to $486. The base rate and most add-on charges were determined years ago when the exclusive franchise system was approved and is now being set in stone as each of the contracts is finalized, with base rates capped at $216.72. Everything in the contract must be approved by the city’s Sanitation and Contract Administration bureaus. Calls to Athens seeking comment were not returned last week. The $216 monthly base rate also appears in a Bureau of Sanitation report from September as the proposed standard for all of the franchise haulers. According to the document, that puts Los Angeles in the middle of the pack for cities with exclusive waste-hauling franchise zones elsewhere in the state, matching base rates in Huntington Beach and Fullerton, but well above the $152 in the city of San Fernando and way below San Jose’s $401. While some of the rates in the Athens contract might change as individual properties are evaluated in coming months, the base rate is not expected to change. Backers of the exclusive waste-hauling franchise system said a single systemwide rate that is transparent and not subject to negotiation is a fairer system for all property owners. “Right now, larger landlords are able to leverage their units to bargain for lower rates, while smaller landlords without such bargaining power are being gouged,” the alliance’s Nothoff said. Almost all commercial and multifamily property owners will be impacted by these higher franchise rates. But for owners of large commercial properties, such as office towers, the amount of the cost increases will be very small compared with overall lease revenue. They also can pass on the costs to tenants, as can owners of apartment buildings built after 1978. It’s the owners of apartment buildings built prior to 1978 and subject to the city’s rent stabilization ordinance who will be most impacted. Those properties operate under a system known as vacancy decontrol: When a unit is vacant, the landlord is allowed to sign up a new tenant at the market rate; after that, annual increases for that tenant are generally limited to 3 percent a year. Vargas and other owners of rent-controlled properties said the huge hikes in trash fees come during another “perfect storm” of other cost increases – including water rates, sewer charges, and, most recently, a seismic retrofit mandate. While 50 percent of the seismic retrofit costs for rent-controlled buildings can be passed on to tenants, the landlord must front the costs – often more than $100,000 – while only getting paid back by tenants in small annual installments over nine years. Vargas is also an executive with Sawtelle property management service RST & Associates, which manages about 20 apartment complexes for different owners. 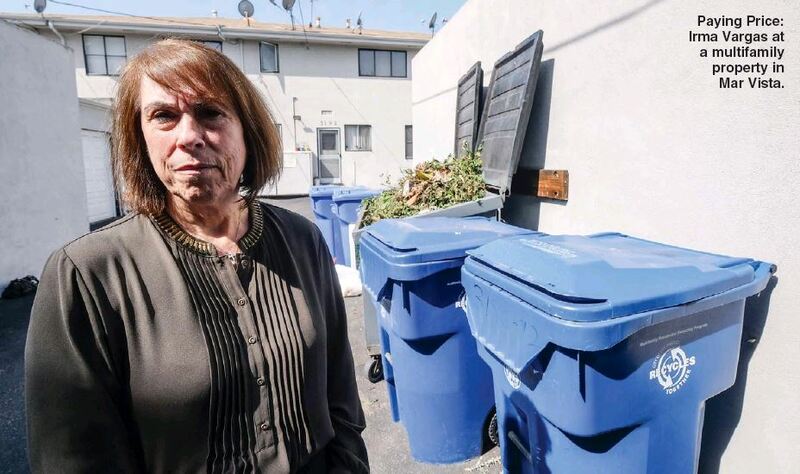 After reviewing the trash fee numbers for all the complexes, she said the franchise rates would be between 50 percent and 125 percent higher, depending on the location of each property. Fred Sutton, government affairs director for the Apartment Association of Greater Los Angeles, said that when the exclusive franchise proposal was being debated, the association tried unsuccessfully to win permission for owners of rent-controlled buildings to pass through most of the higher trash fees to tenants. The association also sought to have nonexclusive franchise zones, such as those that exist in Long Beach, where multiple haulers can serve in each zone. Sutton said that when the program was being debated, city officials promised to keep the rates fairly close to current levels. “That promise was not kept, obviously,” he said. Responding to this, a spokesman for Mayor Eric Garcetti said the key advantage of the exclusive franchises will be stable rates. “We are committed to making sure everyone in Los Angeles has reliable waste and recycling service at consistent, transparent rates,” press secretary Alex Comisar said last week, “and our franchise system will help us fulfill that promise.